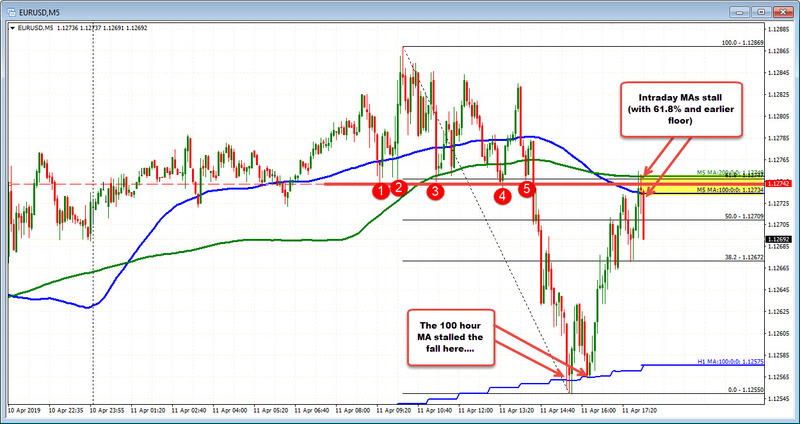 The EURUSD buyers did win the battle at the 100 hour MA below (see earlier post HERE) and squeezed higher. Remember, the EURUSD shorts in the most recent commitment of traders is up around 100K. That is the largest short position since December 2016. That can lead to short squeezes (something to keep in mind). Looking at the 5-minute chart below, the price has moved to the 100 and 200 bar MAs at 1.1273-75 area and put the stall against the MA levels. Also near the area are swing lows from earlier today. Sellers are leaning and trying to put a halt to the squeeze. Traders are trading and it seems that they are taking shots (from long and short side) at technical levels.